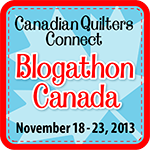 If you are here for the Canadian Quilters Connect Blogathon, check out this welcome post. Pumpkins, stuffed turkey, bountiful amounts of fresh produce, Thanksgiving. That is our theme this week courtesy of Tami at Just One More Thing. While I was searching online colouring pages, I came across this cornucopia. It had everything I was looking for, circles and other interesting shapes. I printed it and started with the grapes. They were a little small to work in much detail, but with so many of them, I found that a little detail goes a long way. about 7 inches wide by 6 high. I drew this on printer paper and found that it didn't work all that well with my Pigma pens, almost as though there is a coating on the paper. I much prefer a proper sketch paper. A few readers have mentioned that they are interested in trying Zentangles. My suggestion is that you visit the TanglePattern pages, pick a straight line tangle and start drawing. If you have a sketch book, use that, search around your kids desk for one of their part empty ones. Using a pencil, lightly drawn a three inch square, this will be your working area. Fill the square with your selected tangle. Don't worry about it being perfect, the variations make it more interesting. After you've completed your first tangle, take a picture of it, post it to your blog and then link up here, don't worry about the theme, in fact, no worrying while you are tangling, remember, it's relaxing. If you don't have a blog, email your photo to one of the regular participants and she'll add it to her next post. After seeing one of Marie's tangles last week that used one tangle, I wanted to do the same with a pumpkin. It still needs some leaves or a border so that it isn't floating on the paper. Next week's theme is ornaments with colour. I'm going with circular ornaments and I'm going to cut out circles. After that, I'm going to imagine some the of the ornaments I've seen, with bands of colour around the middle, or sectioned from top to bottom like the sections of an orange. not sure whether to add the colour first or after drawing, so I'll probably try both. Did you join in with our Thanksgiving theme, or have you been inspired to try Zentangles, add a link to your post below in Mr. Linky. I guess it's true - great minds think alike. I chose the cornucopia also. It was fun to use so many different patterns in one design. Yours is beautiful! I've never thought of doing a tangle with just one pattern. It really shows off the details of the pattern. Thanks for the new idea. Love the pumpkin! I don't mind that it's floating. In fact, I like it. Your cornucopia is awesome! I thought of doing one, but I tried to draw one without success. Didn't think of using a pre-printed one. Great job! I just wanted to add one thing about other joining us. If you don't have a blog and want to participate, I'm sure one of the other blogger would be more than happy to host your creations. Just contact one of them. What a beautiful pumpkin!! I've done a few tangles, they are always fun! Just wonderful Heather! I need to get some time to spend on practicing some Tangles. I stopped by because you left a comment on my blog. Boy am I glad! I would never have found your blog otherwise. I love your zentangles! Now I am inspired. Thanks for the zentangling tips! Those are neat -- I just started following your blog so I won't miss what you do next. I've got a couple of books about tangling on quilts, but haven't tried it yet.